Shockingly - they don't seem to mind and even go trick or treating earlier in the day on Halloween. HA! Twinkle and Lars should be BFFs. He does the exact same thing. And well, I'm sure you remember how on that trip, you had to re-befriend him every time we came back to the house. I love Friday cat blogging. It's a good theme! LOL, Karen, those are great shots! Your dogs look so proud to be wearing them. I would love to dress up Meadow--if nothing else, we could put bumper stickers on her blue jacket and say she's a car. Steph, if Twinkle and Lars are BFFs and Misha and Sid are soul brothers, I guess we have to get a third cat to match Kaspar. 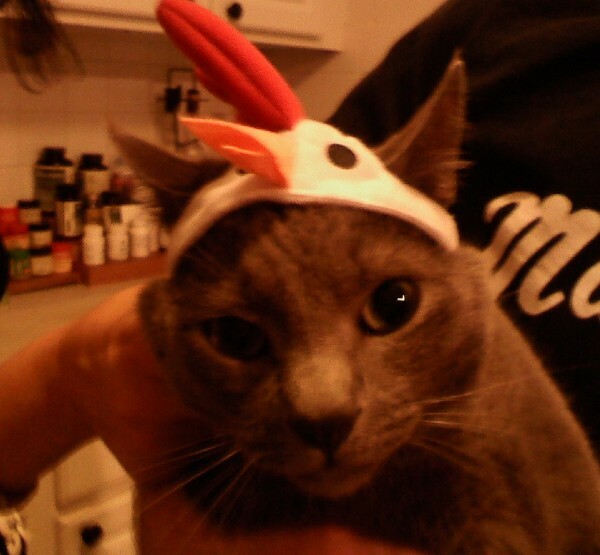 We'll just go to the shelter and see which one wants to wear the chicken hat. Thanks, Tez! Long-distance hugs are Twinkle's favorite kind (she's kind of squirmy, unless it's *her* idea to get in *your* lap or for *you* to rub *her* bellow--otherwise it's "noooo! I don't like touching!")! Uh, that should be "belly," not "bellow."